Before you read below. How about some fun. 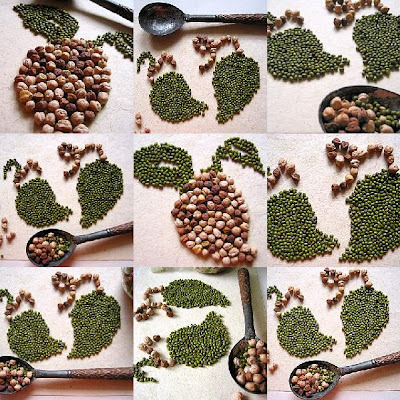 An Interesting item about mothers of animals ( Humans ) and mothers of vegetation ( all seeds and beans ). " When Babies are born to humans, a mother has an afterbirth. And all mothers of vegetation also have an afterbirth " Ask Sprout Growers. com and we will tell you how you can see the afterbirth. And that is life. ARE USUALLY POISONOUS, READ TONY'S ARTICLE. to your body. SPROUTS contain enzymes which aid in digestion and convert starches into sugars, protein into amino acids, and fats into fatty acids. Enzymes are destroyed in cooked food. When live enzymes are available, the body doesn't store unnecessary vitamin and mineral supplements. SPROUTS provide the highest quality proteins, which are easy for the body to use, are low in fat and contain no saturated fat or cholesterol. SPROUTS contain essential vitamins, proteins and minerals in their purest natural forms. SPROUTS provide a good source of fiber, which stimulates the body's internal self-cleansing abilities. SPROUTS slow the aging process. They are an excellent source of anti oxidants. SPROUTS can provide you with a fresh garden in your kitchen when none other is available. Seeds can be stored economically for long periods of time with the potential of many times their weight in fresh produce. SPROUTS are simple, easy and fast to grow. You can have fresh sprouts in 1 to 1 and a1/2 days instead of 3 to 9 days needed to grow most vegetables. SPROUTS can be eaten alone, or in salads, sandwiches, soups, stir fry, pancakes, bread, or just about anything. SPROUTS are the missing link to daily nutrition and home food storage programs. SPROUTS are a true natural multi vitamin pill. See List Here, With nothing missing. THE LOWEST COST AND HEALTHIEST FOOD IN THE WORLD. 30 DAYS OF BREAKFAST COST ONLY $10.00 TOTAL. Sulforaphane has significantly reduced the incidence, multiplicity and rate of development of chemically induced mammary tumors in rats. It has demonstrated an ability to detoxify a number of carcinogens and thus might have the ability to protect against a variety of cancers. It has been shown that dietary supplementation with sulforaphane enhances glutathione S-transferase (GST) enzyme activity, which is known to detoxify many carcinogens. One group of researchers has reported that one to three-day-old sprouts of certain broccoli and cauliflower cultivars contain 10 to 100 times higher levels of glucoraphanin, the glucosinolate of sulforaphane, than do mature broccoli and cauliflower sprouts. Thus they have concluded that "small quantities of crucifer sprouts may protect against the risk of cancer as effectively as much larger quantities of mature vegetables of the same variety." Additionally they have noted that the indole glucosinates that are prevalent in mature broccoli, for example, are present in only small quantities in the sprouts. One report suggested that the degradation products (e.g., indole-3-carbinol) of these glucosinates might themselves promote tumorigenesis, but several other investigators have not confirmed this. Sulforaphane is contraindicated in those who are hypersensitive to any component of a sulforaphane-containing product. An extremely valuable source of oxygen, enzymes, antioxidants and vitamins, minerals and quantities of protein in their most natural form which the body can easily assimilate. Sprouts are readily digested with the help of the many enzymes they contain. The high level of simple sugars in sprouts makes them a quick energy food. Many of the proteins in sprouts are pre-digested, or broken down into their constituent amino acids, making them easily absorbable by the body, even for those with weak digestive organs. Every type of sprout contains a life force that is essential to well-being, and the main reason we eat 1 to 2 day old sprouts is to gain energy and vitality from this life force. Hippocrates , "Let your medicine be your food and your food be your medicine". #1 When we choose to sprout with our indoor “countertop garden”, we are self sufficient and have control over our own food supply (no pesticides) at the very lowest of cost. The freshness is wonderful- a veritable fountain of youth. Beneficial trace elements are stored in seeds at concentrations at least two hundred times the concentrations in other plant material. They are the baby plants in their prime with the greatest concentration of vitamins and minerals than they will have at any other point in the plants life. The nutrients in sprouts are continually increasing-even when harvested and put into the fridge to slow the growth. Sprouts provide the highest amount of vitamins, minerals, proteins, and enzymes of any food per unit of calories. Harvested plant foods that have been shipped from all over the world to our produce departments are now looked upon as table ornaments because of the low amounts of nutrients in them. When there is a shortage of food or cash flow, sprouted seeds can be a life saver. Transporting our “veggies” to the cottage was never easier and seeds can be stored for years. The seeds multiply during sprouting from 8-15 times their weight. #2 Choosing organic is the next most important choice. Kirlian photography shows the organic food having a much larger aura (energy field) than the chemically grown foods. To prevent health problems, we need LIVING (biogenic and bioactive) foods and we can then go a long way towards combating world hunger. Sprouts are the logical choice, abounding with antioxidants, protein, vitamins (especially B vitamins and E), minerals, amino acids, chlorophyll and many more. Sweetness in sprouts, like green peas, wheat, corn, oats, chickpeas, indicates the presence of carbohydrates. The body needs more carbohydrates than proteins and fats for building, growth and repair. Easy to digest –buckwheat and sunflower. Cleansing sprouts—radish, fenugreek, cabbage, alfalfa, clover. Vitamin C—lentils, cabbage, mung beans, adzuki beans, chick peas, cow peas, alfalfaB vitamins help digest carbohydrates and promoted resistance to infection.--alfalfa, wheat, rye, almond, sunflower, sesame (sprouted are richer than raw) High in protein—adzuki, almond, cow pea, lentil, mung bean, pumpkin, sesame. Minerals and trace elements found in the raw unsprouted seeds become more digestible through the sprouting process. Good mix= rye, lentil (use only the green ones), wheat. Sprouts with a stronger flavour can be mixed with others, like alfalfa. Vegetable seeds can be ordered in pound lots-kale, cabbage, turnip, watercress, broccoli, mustard, onion, garlic. Watch for broken, chipped or seeds damaged in any way, as they could spoil the lot. There are always hard seeds in a batch that refuse to sprout. This is natures insurance against extreme weather conditions. There is no way to identify them by looking, so chew carefully. "All that man needs to sustain good health can be provided in nature". ("digestive leukocytosis").Elevated WBCs are correlated to bacterial infection, inflammation and depressed immunity. Raw foods do not produce this reaction. All raw foods contain exactly the right enzymes required to split every last molecule into the basic building blocks of metabolism: Amino acids (from protein), glucose (from complex carbohydrates) and essential fatty acids (from unsaturated vegetable fats). You are what you ate: Eat living foods (at least once daily!). Thorough cooking destroys the ecological balance of the food. It makes 50% of the protein unavailable, destroys 60-70% of the vitamins, up to 96% of the B12, and 100% of many of the lesser factors like gibberellins, anthrocyans, nobelitin, and tangeretin which boost the immune system and other body functions. Cooking foods also disrupts the bioelectrical structure, the bioelectricity transfer power, and the bioluminescence. All of these factors are important for building and maintaining our life force energy and health. Cooking destroys enzymes in live foods. Enzyme reserve seems to be connected to life force, health, and longevity. Ann Wigmore, the "mother" of the raw foods movement, feels that "enzyme preservation is the secret to health”. Enzymes are living biochemical factors that activate and carry out all the biological processes in the body such as digestion, nerve impulses, detoxification processes, functioning of RNA/DNA, repair and healing of the body, and even the functioning of the mind. There are natural enzymes in raw food, which minimize the enzymes that need to be secreted by the body for digestion. The body's enzymes can then be converted and be used for the process of detoxification, repair, and overall healing. The preservation of our enzymes by eating live foods seems to play an important role in slowing the aging process. With age there seems to be a significant drop in enzyme reserve. Cooking our food may also change the molecular structure of its components and consequently impair our health. For example, researchers found that Eskimos eating about two pounds of raw blubber a day had no heart disease or atherosclerosis. When this same community of Eskimos began eating the same amount of cooked blubber, they developed high rates of heart disease and atherosclerosis. Other researchers have since found that cooking fats changes their molecular structure in a way that disrupts cell structure and impairs cellular function. Satya Sai Baba, one of the few Indian spiritual teachers who have transcended his culture's food tradition, makes the essential point why people may be slow to make their diets high in live foods. He says: "Out of all the species... Man alone tries to cook and change his food. A seed when planted will sprout to life... but when cooked, the life is destroyed... man does not like to partake of food as God created it. He is the victim of his tongue, which he wants to be satisfied in terms of taste, and so his own likes and dislikes come in the way of what he should eat. Because he is exterminating the life-giving forces in the food available to him, he is increasingly subjecting himself to disease." Most Hospitals in the world serve coffee in the morning before breakfast. Then a cooked breakfast. None of which provides sufficent enzymes. Then many hospitals like the ones in Ontario, Canada serve you ginger ale with lunches and dinner. Which is a form of poison to the body. In other words they are killing you in the hospital. That just does not make sense. Does it?. Seeds contain 'antinutrients' - substances such as saponins, tannins, 'protein splitting enzymes' inhibitors, and phytates. These compounds reduce the body's ability to access the nutrients in seeds. The type, and amount of anti-nutrient varies both with the species of plant, and with the local variety of the species (common beans, Phaseolus vulgaris, for example, have a wide range of phytic acid and tannin concentrations - with white seeded beans having least tannins-depending on the variety). Some have several different anti-nutrients, some have few, some have relatively a 'lot' of any one anti-nutrient, some have very little. Most, but not all, antinutrients are destroyed or reduced by cooking. Soaking and leaching are necessary to reduce some antinutrients, particularly in some varieties of bean and other legumes. Soaking and sprouting seeds also reduces phytates. Soybeans, for example,contain a 'tryptophane inhibiter' that interferes with the absorption of the amino acid 'tryptophane'. The inhibitor can be neutralized both by cooking and by sprouting (the sprouted root must be 3 to 4 inches long for this to be largely complete). Other seeds are also rich in protein. Sesame seeds are about 20% protein, although, like grains, they are low in lysine. Mixing them with a legume such as the chickpea, Cicer arietum, (e.g. in the middle Eastern dish 'houmous') balances it out. Both sunflower seeds and pumpkin seeds are also high in protein. Grains are a very good source of magnesium, calcium, and potassium. Grains are a good source of chromium- necessary for maintaining normal glucose tolerance (low chromium intakes are very common in the industrialized diet, and over the long term this chromium deficiency may contribute to onset of type 2 diabetes mellitus, or middle-age diabetes). Legumes are a useful source of these minerals. Seeds in general are excellent sources of B-complex vitamins and vitamin E.
Two of the most critical nutrients for humans are folic acid, essential for normal cell division, immune response and correct development of the fetus in the womb; and thiamine, vitamin B1, essential for metabolizing the carbohydrates in seeds, nuts, and tubers. 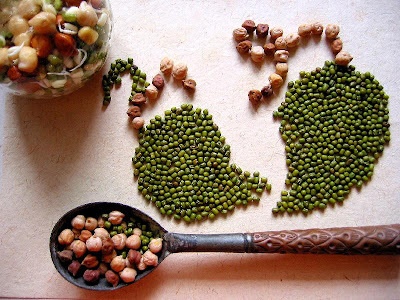 Legumes, interestingly, are particularly rich sources of both these fundamentally important elements. Research shows that sprouts are a veritable fountain of youth. Sprouts abound with antioxidants, they are full of protein, chlorophyll, vitamins, minerals and amino acids. Broccoli sprouts have been found to contain 50 times as much of the antioxidant sulfurophane as mature broccoli. Wheat Grass juice is the closest substance to hemoglobin known and is therefore a phenomenal blood purifier and liver de-toxifier. Sprouts contain enzymes, giving your body a much needed rest as they digest themselves - invigorating you while requiring no help from your body to process them. New research indicates that peanut sprouts reduce harmful cholesterol and that sunflower, buckwheat and grain sprouts dramatically improve the quality of life of diabetics. The list goes on and on. If using seed butters, you should use the toasted kind, as raw seeds and nuts contain phytic acid which once eaten readily bond to minerals such as iron, zinc and calcium, preventing their absorption in the body. Sprouting or cooking (heating) reduces or eliminates phytic acid. Let's get back to enzymes. Raw foods are rich in enzymes. Enzymes are needed for the digestive system to work. They are necessary to break down food particles so they can be utilized for energy. The human body makes approximately 22 different digestive enzymes which are capable of digesting carbohydrates, protein and fats. Raw vegetables and raw fruit are rich sources of enzymes. While all raw foods contain enzymes, the most powerful enzyme-rich food is sprouted seeds, grains, and legumes. Sprouting increases the enzyme content in these foods enormously. Lack of digestive enzymes can be a factor in food allergies. Symptoms of digestive enzymes depletion are bloating, belching, gas, bowel disorders, abdominal cramping, heartburn and food allergies. All of us loose our ability to produce concentrated digestive enzymes as we grow older. In cases where age is a factor, or where lack of digestive enzymes causes food allergies, supplementation may be helpful. You may also want to explore food combining. Have you ever heard of a vegetable which continues to gain vitamins after you harvest it? Sprouts do this. Sprouts are LIVING foods. Even after you harvest your sprouts and refrigerate them, they will continue to grow slowly and their vitamin content will actually increase. Compare this with store-bought vegetables and fruits, which start losing their vitamin content as soon as they’re picked and often have to be shipped a thousand miles or more in the winter. Why eat sprouts? There are many reasons. In addition to providing the highest amount of vitamins, minerals, proteins and enzymes of any food per unit of calorie, sprouts deliver them in a form which is easily assimilated and digested. In fact, sprouts improve the efficiency of digestion. Sprouts are also deliciously fresh and colourful. Sprouting at home takes only a few moments a day and can produce a good portion of your daily requirements of the nutrients you need from fresh produce. The hassles are minor, the costs are low, and the freshness is wonderful. It is a very effective way to add raw foods to your diet. INSERT - The "Tony Hornick" Sprouter takes only 24 to 30 hours to make Mung Beans edible. Growing your own sprouts means having fresh organic vegetables every day from a square foot of counter space. Common seeds for sprouting include alfalfa, fenugreek, peas, lentils, radish and red clover. Mung beans have been sprouted in Asia for thousands of years, And are the most favored for sprouting. Other seeds include broccoli, cabbage, mustard seed, garbanzos, and quinoa. Growing sprouts is economic. Seeds can multiply 8-15 times their weight. Depending on what you grow, you can get away with spending very little for a pound of fresh sprouted indoor-grown organic greens. In the long number of years that I have been eating sprouts I have read many articles and listened to many arguments about the values of sprouts. I have learned that most people believe that they are good for you. But they do not know why. I have read various reports about the nutritional value (and there are many). Very few are consistent in their reports. I can only assume because of the inconsistency that studies were done at different ages of the sprouts. However, when I first started to eat sprouts when I was 35 yrs of age, and am now 86. I remember one item which made a lot of sense. And had I known that some day I would be selling a Sprouter to the public I would have kept the article. Here is what I remember about the article that to this day is still fresh in my mind and makes a lot of sense about the value of sprouts. “At the day when a human child is born, God and the mother give that child every nutritional value to start life with. They (God and the mother) do not say to the child you will only get vitamin A and B. The child gets all known nutritional values plus things we do not understand yet. Likewise all babies of plants (sprouts) are given the same start in life on the day of birth. All nutrients are given to the sprout. All, not just vitamins C and D, but everything. Then over the next 2 to 9 days it starts to throw off what it will not need as a grown plant. e.g. Take a head of lettuce. It has little nutritional value but that does not mean there are not other values that we at this time do not understand. Obviously, the lettuce seed was nutritionally complete when sprouted, but the plant only kept part of that nutritional value as it grew. Sometime during the first few days the seeds nutritional value changed to only produce a head of lettuce with little value ( so we think )" Another way to look at why nutritional value is greater at birth than later. The genes of the plants tell it that it does not need all the vitamins that other plants need or it does not need the same vitamins that other plants need. So, the baby throws off those nutrients that it does not require to produce the grown plant. As a baby it had everything. That philosophy here in this summary made a lot of sense to me. On the web there are several articles that in some way re-inforce these statements. In the research done recently at Harvard University ---The scientists discovered that seeded fruits have the longevity genes, while the seedless varieties possess fast-aging genes. It is as if the plant decides that its nutritional content has been so altered that the plant commits suicide by not producing seeds. Subsequently, when we consume seedless fruits, we consume fast-aging genes. Seven apricot seeds per day, containing the purest concentration of nature's Vitamin B-17, are guaranteed to give you a cancer-free life. For those already diagnosed with cancer, a slightly higher amount will restore your health and give you a cancer-free life. All societies that eat a great deal of apricot kernels, have zero cancer. Laetrile is used in over 30 countries to combat cancer. There is much scientific proof of its efficacy. There is a strong possibility that the pharmaceutical multinationals have undertaken a campaign against Laetrile due to their inability to patent it. Laetrile is in the same "social" category as Essiac - perhaps the ultimate cure for cancer - but subjected to wide disinformation campaigns for capitalistic reasons. The enzyme Beta-Glucosidase releases the tightly bound and unavailable toxins - Benzaldehyde and organic Cyanide - from the Laetrile molecule and allows them to act synergistically (by a factor 100) to swiftly wipe out cancerous tissues. Another enzyme, Rhodanese, which has the ability to detoxify Cyanide, is present in normal tissues but deficient in Cancer cells. These two factors combine to cause a selective poisoning of Cancer cells by the release of Cyanide from Laetrile, leaving non-cancerous cells undamaged. Cancer occurs only as a result of a direct deficiency of Laetrile and those so-called carcinogens really just contribute to cancer by placing further stress on the body that precipitates the Cancers that result from Laetrile deficiency. Independent research has also proved that a Himalayan tribe known as the 'Hunza' do not contract Cancer for as long as they adhere to their native diet which is exceptionally high in both Apricots and Millet. Once exposed to western diets they become as vulnerable as other populations to Cancer. Click here to read Dr. Krebs speech on B17 at the Cancer control convention. Scurvy, rickets pellagra and Beri Beri were simple deficiencies of vitamin C and vitamin B and also took decades and killed millions before the medical industry of the time accepted the simple vitamin solutions. We are in a nearly identical situation concerning cancer. Found this statement on the web in reference to Sprouts. are in sprouts. All the vitamins, Most Minerals, UP to 3000 enzymes, and Up to 560 Proteins. in the water that first appeared on earth from steam. ( Going back to basics ). But that does not mean that distilled water is good for you. You must ad minerals to distilled water. Is this being realistic ? In the animal kingdom Mother Nature gave babies every nutrient to be healthy and live. In vegetation Mother Nature gave every baby sprout every nutrient to be healthy and live. This is an excerpt from the book The Root of All Disease by Elmer G. Heinrich. everywhere near the earth’s surface so plants must have been extremely nutritious. This type of plant nutrition existed for millions of years but eventually the earth succumbed to wind and rain erosion, continuous plant growth and man’s unwise farming practices and eventually chemical fertilizers. As time past, the minerals became depleted near the surface of the earth. This depletion began several thousand years ago but was dramatically accelerated two hundred years ago and now it is like a plague. The soil near the top eight feet of the earth, where our plants grow, is severally devoid of minerals compared to millions of years ago. When you test surface soil today, from anywhere in the world, you find no more than 20 minerals. When you test earth from a much deeper zone, or if you test volcanic ash, you find at least 84 minerals. This provides proof our surface soils are deficient in minerals. If soil is deficient in these vital organic molecules, our plants and foods will be deficient in these organic molecules. You don’t need a PhD in realism to understand this problem. We are what we eat, they say; so all of us should be alarmed by new research from several well recognized research teams that suggest the nutritional value of modern foods isn't just declining, it's collapsing. This research is a warning of imminent approaching danger! We are losing our minerals, the fundamental source and the basic building blocks of life. I'm not just referring to processed foods. I'm talking about fresh fruits and vegetables and basic foodstuffs such as milk, cheese, beef and chicken. Further on I will produce evidence that during the last 60 years, the level of iron, a vital mineral for good health, has dropped 55 percent in the average rump steak. During the same period magnesium plummeted by 21 percent and calcium was also significantly lower. In fact, every mineral, except the three used to fertilize today's farmlands, was anywhere from 10 percent to 40 percent lower than 60 years ago. We need to take notice that our foods are nutritionally bloated with chemical soil mineralizers that attempt to invigorate minerally depleted soils. Down on the commercial farm, quantity now triumphs over quality at every turn and, in their desperation to make even a halfway decent living, many of today's Farmers, pushed by their supermarket masters to produce high yields at low cost, seem to have forgotten that there was a reason their grandfathers farmed in a different way. Today, the nutritional value of food is lower than ever in history and it will continue a rapid decline in the future. The problem is real and what is so alarming; there is nothing we can do about it! World Governments are concerned about global warming and some effort is being made, slowly I might add, to address this catastrophe. I'm sure global warming could be reversed if every country put forth the initiative to reduce the elements that threaten our atmosphere. But, what are World Governments going to do to remineralize the soils? Absolutely nothing because this is impossible on a world-wide scale. Yes, farmers could fallow and let their land lay idle for a year or two. This would improve the food somewhat but it would not put back the minerals that are depleted. They are gone and they probably will never be back in the top eight feet of the earth's surface, where our plants grow, until the earth encounters another ice age. Many of our modern day farmers are on a treadmill of dependency on soil mineralizers, pesticides, insecticides and plant food that creates unnatural growth and very little nutrition due to a lack of minerals in the soil. The food and farm industries don't like to hear about mineral depletion in soils, but the new findings are totally in line with other prominent research that leads to one shocking conclusion. Chemically dependent modern farming methods do not produce nutritious food for several reasons. They are not designed to and can't because of the mineral problem. These mineral deficiencies exist all over the world. I admire the Government of the United Kingdom because they acknowledge, are not ashamed of and admit they have a mineral depletion problem. In 2000, the Soil Association quoted figures from the Department of Environment, Food and Rural Affairs, that trace minerals in the UK fruit and vegetables had fallen by 76 percent. Similar figures from the United States Department of Agriculture indicated that this wasn't just a British problem. More about this mineral deprivation will be forthcoming. Minerals, as we know them, are locked in the earth's crust. As land dwellers, our main link with minerals is through a diet of plants that are able to extract and assimilate metallic minerals from the soil as they grow. Our secondary link is from meats of animals that eat plants. Minerals are extremely important for our well-being, yet they have always been taken for granted, and few of us have given them a second thought. Until a few years ago, no one knew of or cared about the importance of these essential building blocks that make up about 96 percent of our bodies. Now that minerals are enjoying tremendous success in the marketplace, it is only prudent that users learn more about them. Mere knowledge of minerals, their importance and differences may shed new light on why they are so necessary for us to stay healthy. Without minerals, nothing else, including vitamins and enzymes, would benefit. We must also remember that in order for minerals to provide their utmost benefit, we may need to make some lifestyle changes. Extending your life and growing biologically younger is now a rational desire, because we clearly have reasonable processes that will do just that. These changes may include a food selection change, better drinking water, more stretching and exercise, less stress, more rest, less smoking and drinking, and the intake of considerably more usable oxygen. A complete spectrum of minerals is the benchmark for ultimate and total nutrition, but not the total answer to excellent health. In order for us to understand the importance of minerals, we need to first understand how minerals are composed. Vitamins, carbohydrates, proteins and lipids are all compounds of the chemical element known as carbon. Minerals from the earth are elements that are not carbon and which are not bound to carbon. These minerals participate in a multitude of bio-chemical processes necessary for the maintenance of health in human beings and the animals that inhabit our planet. Nearly everything on earth is comprised of minerals. Your ring, belt buckle, lampshade, stove, wallpaper, flooring and your automobile would not exist if there were no minerals. God made man from minerals and man requires minerals for his mere existence. Every other living creature has the same requirement. There would be no life without minerals! Minerals control millions of chemical and enzymatic processes which occur in the human body at all times. The same is true for animals. This knowledge should make us aware of the importance of minerals for mankind's survival. Although some are very rare, there are more than 100 mineral elements found on earth. Four of these, oxygen, hydrogen, carbon and nitrogen make up 96% of our body. The remaining 4% of our body is basically made up in part of 70 or more minerals, most of which are no longer readily available in our soils. The world governments and scientific communities have grouped minerals into two categories. Those that are considered to be required in our diets in amounts greater than 100 milligrams per day are called major minerals. Those that are considered to be required in our diets in amounts of less than 100 milligrams per day are called trace minerals. Both major and trace minerals are in the same class. The only difference is the name and the recommended daily amount (RDA) required according to the World Health Organization. There are only seven major minerals. They are calcium, magnesium, potassium, phosphorus, sulfur, sodium and chlorine. Our bodies should contain significant amounts of each! Trace minerals, on the other hand, are present in the body in very small amounts. It is thought that each makes up less than one hundredth of one percent of our body weight. Broccoli sprouts contain 20 times as much as glucoraphanin than mature broccoli. Glucoraphanin converts to cancer-fighting sulforaphane in the body. Sulforaphane prompts the body to make an enzyme that keeps tumors from forming! Sulforaphane also kills H. Pylori, the microbe that causes stomach and duodenal ulcers. - Dr. Robert Jay Rowen's Second Opinion September 2002. Also found something very interesting at Indira’s blog @ Mahanadi. She’s calling for mango based food art…for a creative event called Mango Manthram. In her words, ” The color and shape of the mango are an artist’s dream. Mango tree, mango leaves, mango fruit in various stages of development, and the scrumptious dishes we can prepare with mango - the magic of mangoes is a timeless tradition that is steeped in art, history and romance. Bring your own touch, and interpret your mango memories and experiences through Food Art. The field is wide open”. So you can see how carried away I got. Had the time of my life; was transported back to gleeful childhood where I remember making fishes out of dal! Here I tried my hand making mangoes using the same dals! Was relieved when the boy said “Nice mangoes Mama“, which meant they remotely resembled mangoes, & the daughter declared them COOL!! A Sprout eaten within the first 2 days of birth has ALL nutrients that our bodies need to stay healthy. That is: everything we already know and what we are still not aware of. It is said that sprouts ‘represent the miracle of birth’. They are in the true sense, super foods. They are alkaline, whole, pure, and natural foods. It is inexcusable that though aware of their miraculous effects, we do not take full advantage of them. Sprouts are veritable stars of the vegetable world. Their numerous and widely touted health benefits include high levels of dietary fiber, B complex vitamins and protein. Mung bean sprouts provide 32 calories and 0.84 grams of fiber per cup and 21 to 28 percent protein by weight. Sprouts also contain digestive enzymes and some of the highest known levels of certain antioxidants. One cup of sprouts provides 119 percent of your daily allotment of vitamin C. Of note are certain compounds not contained in sprouts that make them healthier. Harmful compounds, such as tannins, that are present in seeds are eliminated during the soaking step, which occurs prior to sprouting. This website has a very good report and should be read completely. Their report is missing much. This report is excellent , of great value. A full history about mung beans and their value in curing illness. Have you read the following article by Tony Hornick. Maybe its about time you did.